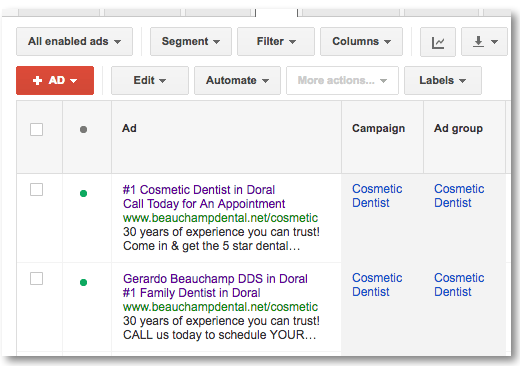 Are you looking to invest into Google Adwords but don’t know where to start? Or do you already have an account but it’s not generating leads and wasting your budget? Well we can assist you on either route. Adwords is a great investment for any small business looking to generate more monthly leads and revenue; if you believe otherwise it is very likely due to your account being set up inappropriately. Pay-per-click advertising delivers instant traffic to your business by placing your website at the top positions of the search engines as you build up your SEO. With Adwords taking up larger real estate space on Google’s SERP, your company should aim to be on top. Ideally you want to show on paid ads, on the local map and organically. We can help with all three. What’s included in Our AdWords Management? Our Google Adwords management begins at $675 for the first month for 2 Ad Groups, which includes set-up and execution for the two Ad Groups, creation/optimization of landing pages, and 2 call tracking numbers. After that it will be $400 a month for us to monitor, manage, and optimize. If you would like to add more Ad Groups, it will be an additional $75 for each which would include it’s own call tracking number as well.